How does Micro RF Needling work? 1. Fine needles are inserted into the skin depth. The depth can be adjusted to the area we treat and the pathology we are targeting (skin laxity, scars, wrinkles). The skin penetration in itself stimulates the skin to heal and produce new collagen. 2. While the needles are inside the skin, bipolar radio-frequency energy is applied to the target area. The heat applied to the deep layers of the skin further enhances the fibroblasts laying new collagen. This dual action ensures that while we have minimal damage of the surface of the skin, the deeper skin layers undergo a powerful regenerative process. 1. Area to be treated is cleaned and covered with topical anaesthetic cream for about 45 minutes. 2. 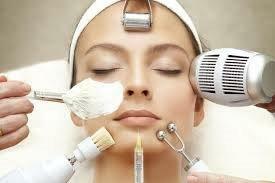 The treatment is performed, typically a full face takes about 30 minutes. After the procedure the skin is red and feels tight for a few days. Make up cover is appropriate and there is no social downtime. Simple moisturizer and sunscreen are applied immediately after the procedure and regular skin care can be resumed after 10 days. Collagen production starts at 6 weeks and continues to 6 months. Excellent results can be seen after 1 treatment but generally we recommend 3 sessions 1 month apart. The procedure is very well tolerated and the pain is minimal.